0 - Black Handle, Flat Pitch, Pure Chinese Bristle Flat shape, long natural, clear laquered handle. White Chinese hog hair bristle. Ideal for use by school children at all levels. It is very economically priced and can be used for poster colour, oil and acrylic painting. ..
10 - Black Handle, Flat Pitch, Pure Chinese Bristle Flat shape, long natural, clear laquered handle. White Chinese hog hair bristle. Ideal for use by school children at all levels. 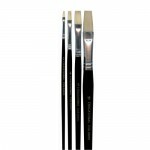 It is very economically priced and can be used for poster colour oil and acrylic painting. ..
12 - Black Handle, Flat Pitch, Pure Chinese Bristle Flat shape, long natural, clear laquered handle. White Chinese hog hair bristle. Ideal for use by school children at all levels. It is very economically priced and can be used for poster colour oil and acrylic painting. ..
14 - Black Handle, Flat Pitch, Pure Chinese Bristle Flat shape, long natural, clear laquered handle. White Chinese hog hair bristle. Ideal for use by school children at all levels. It is very economically priced and can be used for poster colour oil and acrylic painting. ..
16 - Black Handle, Flat Pitch, Pure Chinese Bristle Flat shape, long natural, clear laquered handle. White Chinese hog hair bristle. Ideal for use by school children at all levels. It is very economically priced and can be used for poster colour oil and acrylic painting. ..
18 - Black Handle, Flat Pitch, Pure Chinese Bristle Flat shape, long natural, clear laquered handle. White Chinese hog hair bristle. Ideal for use by school children at all levels. It is very economically priced and can be used for poster colour oil and acrylic painting. ..
2 - Black Handle, Flat Pitch, Pure Chinese Bristle Flat shape, long natural, clear laquered handle. White Chinese hog hair bristle. Ideal for use by school children at all levels. It is very economically priced and can be used for poster colour oil and acrylic painting. .. Size 20 - Black Handle, Flat Pitch, Pure Chinese Bristle Flat shape, long natural, clear laquered handle. White Chinese hog hair bristle. Ideal for use by school children at all levels. It is very economically priced and can be used for poster colour oil and acrylic painting. 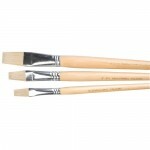 ..
4 - Black Handle, Flat Pitch, Pure Chinese Bristle Flat shape, long natural, clear laquered handle. White Chinese hog hair bristle. Ideal for use by school children at all levels. It is very economically priced and can be used for poster colour oil and acrylic painting. 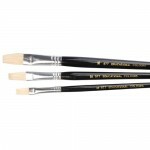 ..
6 - Black Handle, Flat Pitch, Pure Chinese Bristle Flat shape, long natural, clear laquered handle. White Chinese hog hair bristle. Ideal for use by school children at all levels. It is very economically priced and can be used for poster colour oil and acrylic painting. 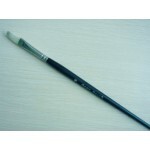 ..
8 - Black Handle, Flat Pitch, Pure Chinese Bristle Flat shape, long natural, clear laquered handle. White Chinese hog hair bristle. Ideal for use by school children at all levels. It is very economically priced and can be used for poster colour oil and acrylic painting. ..
1 Hog Hair, Flat Pitch Flat shape, long natural, clear laquered handle. White Chinese hog hair bristle. Ideal for use by junior students and amateur artists. Suitable for oil and acrylic work and can be used for poster and mixed media effects. ..